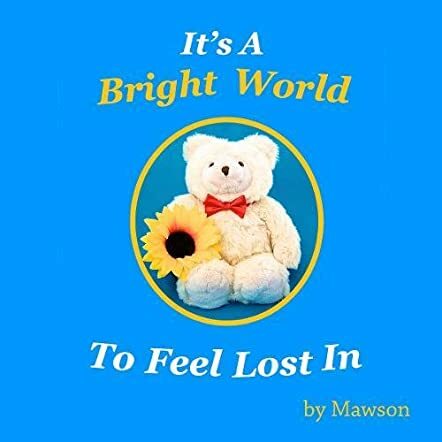 It's A Bright World To Feel Lost In, by Mawson is a humor/comedy book for children of all ages written by Mawson Bear, who is otherwise known as Mark O’Dwyer. A bear’s world is bright and shiny, and filled with infinite possibility, but sometimes waiting for that special someone to share the world with can be hard. Bears know that their someone is out there and on the way, and they can feel those hugs even before the awaited one is in sight. Bears love unreservedly and don’t seek to change their loved ones. And then they do the hardest thing of all, which is to watch those loved ones grow up and go out to explore their own expanding worlds, leaving their bears behind. But they do come back...usually, and share those adventures. And then, there’s the art of being oneself, of penning the perfect poem to celebrate me instead of us, which certain bears can do so well. And always the chance of being discovered once again. Mawson Bear’s heartwarming and poignant humor/comedy book for children of all ages, It's A Bright World To Feel Lost In, by Mawson, will captivate anyone who’s shared a secret with their teddy bear or felt the comforting warmth of that furry presence in the bed on long dark nights. Mawson’s story is lyrical and compelling, and the illustrations which accompany the text are brilliant. Each image is cunningly composed and photographed to showcase the artist Bear in the best possible light and reveal both his personality and depth of emotion. It's A Bright World To Feel Lost In, by Mawson is most highly recommended.